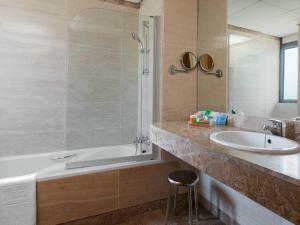 Large quiet room with good bathroom. Comfortable. Bus to Madrid every 15m and close by. Dear TH LA Florida hotel manager, I wanted to recommend the service given to me by your staff, On May 23rd. 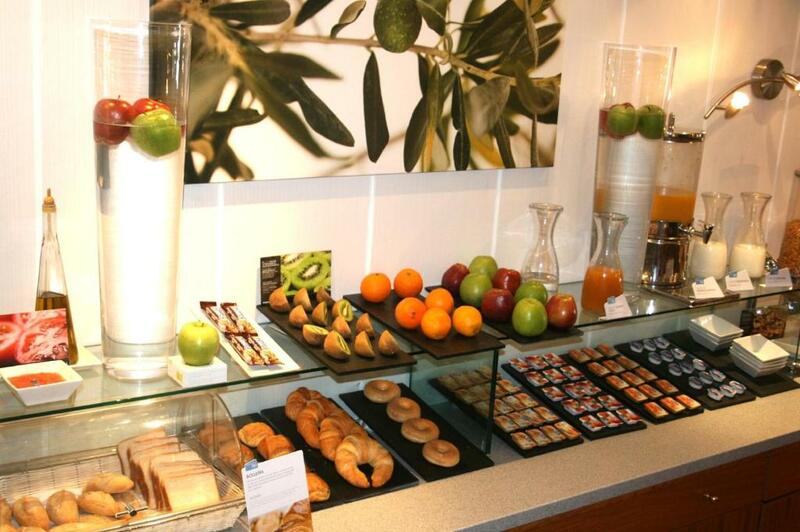 i arrived around midnight straight from the airport quite famished, and all i wanted was to have a quick snack & drink but the hotel restaurant was already closed, the lady at the front desk -MAR was amazing!!! -she took upon herself to make it happen, she went into the closed restaurant spoke to the manager (i believe Antonio was his name) explained the situation and he voluntarily "opened" the kitchen for me , prepared a fresh Pizza which i got with a cold pint of beer - really made my day & night :-) this kind of personal responsibility & attitude toward a hotel client i haven't seen in many years travelling the globe, in my next business trip to Madrid ill book this place again mostly because of the above. Thank you all again, Eli Sheffer. The staff were cheery and helpful. the room was reasonably clean. The bed was nice and big and very comfortable. It was very clean and cleaning staff were nice & friendly. Even the basic apartment is a large two roomed apartment with cooking facilities. I stayed there before about 8 years ago and it was much nicer then. It could do we refurbishment. Estuvimos en el apartamento de dos habitaciones que también tiene dos baños y cocina equipada que ha sido perfecto para la familia y mascota. Limpio, amplio, muchísimos armarios, calefacción perfecta, camas confortables. La zona es empresarial y el fin de semana es muy tranquilo. El personal es una maravilla. El desayuno bien calidad precio. Había leído comentarios muy negativos y tenía hasta miedo de lo que podía encontrarme. A mí me ha encantado, nosotros fuimos en coche, pero vimos una parada de autobús al rodear la esquina del hotel, la habitación estupenda, limpieza mucho mejor que en otros hoteles de más estrellas, la zona es tranquila y se puede aparcar fuera fácil en el fin de semana. Sauber und günstig. Aber auch nicht mehr. sehr einfach eingerichtet etwas alt. TH La Florida This rating is a reflection of how the property compares to the industry standard when it comes to price, facilities and services available. It's based on a self-evaluation by the property. Use this rating to help choose your stay! The TH La Florida is located 8.1 mi outside Madrid city center, with direct access to the N-6 motorway. It is bright and modern, with a peaceful garden. This property has stylish, comfortable rooms. 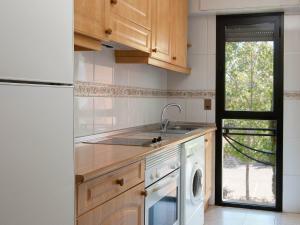 It also offers apartments, with a separate living area and kitchen and free Wi-Fi. The TH La Florida also has a bar and a restaurant, which opens for breakfast and lunch daily and a cafeteria service during the week. 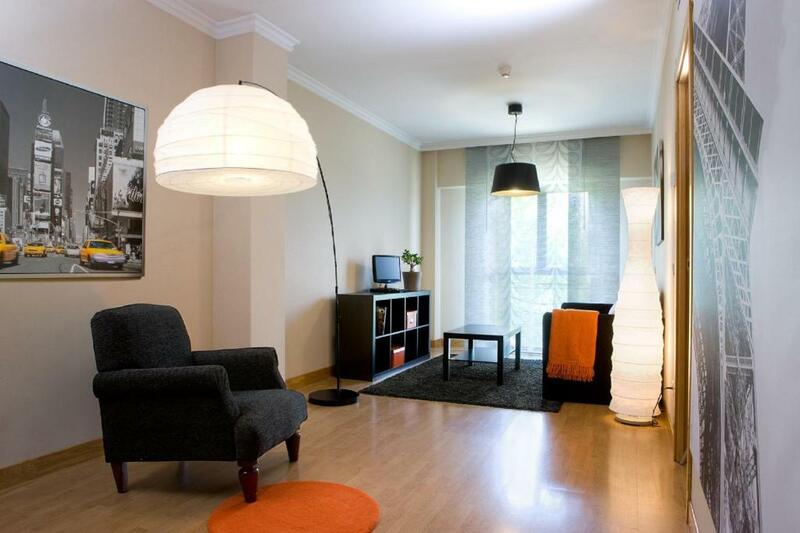 This accommodations is in the quiet, residential La Florida district, near Pozuelo and Aravaca. It is a 10-minute walk to Sexta Avenida center, with many shops and restaurants. Lopez Maeso Tennis Club is 2.2 mi from the property, and El Barrial - C.C. Pozuelo Train Station is 4.3 mi away. There is also good access to central Madrid by public transport, with a direct bus service. The Nisa Pardo de Aravaca Hospital is also nearby. A golf course is available at Club de Campo, just 5 mi away. When would you like to stay at TH La Florida? 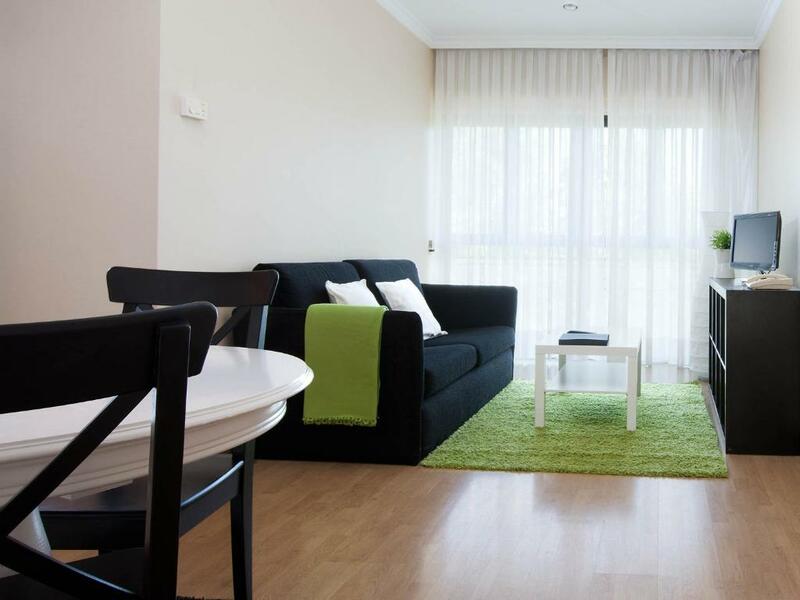 This air-conditioned apartment features free WiFi and a separate living room. The kitchen is equipped with a hob and a washing machine. Private parking is available on site (reservation is not needed) and costs EUR 8.80 per day. This air-conditioned studio features a free Wi-Fi, satellite TV, a private bathroom with bathtub and a hairdryer. It also features a kitchenette. 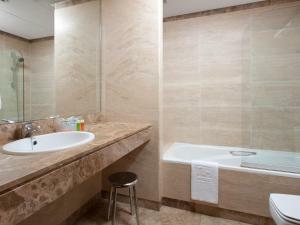 This air-conditioned apartment has free Wi-Fi, a satellite TV, a private bathroom with bathtub. It also has a kitchen with fridge. This air-conditioned room features free Wi-Fi, a satellite TV, a private bathroom with bath and a hairdryer. Los huéspedes del TH La Florida de Madrid pueden elegir entre tres estilos de habitación. La prioridad está puesta en la comodidad, el estilo y el servicio de nuestras 41 habitaciones y apartamentos. La cocina totalmente equipada con menaje básico es ideal para preparar comidas, bocadillos y bebidas, una comodidad muy útil para familias y viajeros individuales. Los apartamentos más grandes también cuentan con una sala de estar independiente con sofá, sillones y un amplio escritorio. Cualquiera sea tu preferencia de habitación, encontrarás una gran variedad de comodidades modernas, como televisión vía satélite y conexión a Internet (WiFi). El TH La Florida se esfuerza por recrear un agradable hogar lejos del hogar, con diferentes tamaños de camas y opciones para incorporar a la cocina, como microondas. House Rules TH La Florida takes special requests – add in the next step! TH La Florida accepts these cards and reserves the right to temporarily hold an amount prior to arrival. Please note that the restaurant will be closed for dinner from July 15 to August 31. Room was dirty .and dusty . Not cleaned well . Noisy and AC not working . Taxi cost 20 euro to get to the nearest metro station . Or 12-15 euro with Uber . Facilities are worn out and apparently there is no budget to fix them. The bed mattress survived at least two its lifetimes Shower was broken, although it is rarely in perfect shape in any other cheap place. Bathroom wasnot clean and they use just old blankets also when you come to hotel after 9 pm there is nobady in reception you have to make your checkin by the machine and it doesnt work effectively. Television has not 1 English speaking channel. Other channels were often with poor signal. Fridge did not appear to work. Older guy who served at the bar in the evening looked and sounded bloody miserable and tired. So-called restaurant only seems to be open for breakfast. Not open in evenings! Roads outside the hotel grounds are solid with parked vehicles during the day so make sure you can park on-site. The whole atmosphere of this place is one of decline & decay. It used to be part of the NH chain but is no longer. The decor is tatty and out-dated. The roof in reception was leaking. The dog barking in one of the neighbouring rooms highlighted the poor sound insulation. Very dark seedy room, no fridge switched on when we arrived, lights not good at all,ashtray in the room even though we requested non smoking room. Smell of smoke outside the door in hall and coming from rooms next to us,noisy in the evening from people next to us and terrible internet connection early evening, guess it was so many business people staying there every night and all using it! Kitchen facilities was terrible, no knives, chopping board, kettle, toaster, coffee maker,bottle opener, tin opener, we had to buy plastic bowls for our soup. Thankfully we brought our own openers, cloths , washing up liquid as there was a 3 euro charge for that! No toilet brush, no rugs or carpets on floor, was cold floors in January! Parking was limited as places are permanently booked out for regular businesses, charge is 8.80 per day if you can get a space in an open place..we parked on the street outside the gate for free! The rooms were really comfortable. Very difficult to find. Located in a semi-industrial area with no nearby facilities. Restaurant shuts at 9:30 which is very early by Spanish standards.